It’s raining again in Lagos this morning. Yesterday, it rained non-stop from 9 in the morning until 9.30 in the evening. It was a continuous symphony of heavy torrential downpour followed by mid-level rainfall that lasted for hours. Although no one measures rainfall levels, this is probably the longest stretch of downpour I have experienced in Lagos. For no reason at all, I can only think of the ‘purple rain’ song by Prince. Not that there is any link that I know between the two. As much as I love the coolness and the smell of freshness that rain brings, I am also mindful of its destructive impact on the city and the difficulties it brings to commuters and other city residents. Many commercial buses, given their substandard state, wisely stay off the roads when it rains leaving commuters stranded for hours and being ripped-off by the few buses that can brave the downpour. Also, houses are easily flooded due to lack of proper drainage and in some areas, rain-induced erosion may be irreparable. A few days ago, after another downpour which was mild in comparison to what we are currently experiencing, I watched a father gave a gut-wrenching account on television of how two children went to school and only one came back home, the other swept away by the flood. 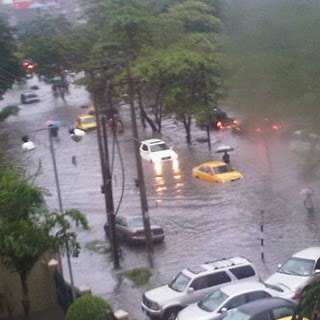 There are very many reasons why Lagos finds it difficult to cope with heavy rainfall. For a start, drainage infrastructure is non-existent, so even for the most affluent part of the city such as Lekki, Ikoyi and Victoria Island; rain is a curse not a blessing. Added to this are the other issues of poor planning, illegal buildings on drainage paths, and as pointed out by a commentator, many compounds are completely concreted resulting in all rainwater being drained onto the roads rather than naturally into the soil. Importantly, we need responsible governments with the political will (not just in Lagos), to not only enforce planning rules, tackle erosion, but also provide an efficient and affordable refuse disposal system so that Nigerians can stop dumping refuse in the gutters, canals and rivers. Loving Nigeria is so very complex. There is so much to be done. Not all problesm can be resolved at once. Now that Nigeria has some accountable leadership, some problems can be resolved. Just be patient. Nigeria has been projected to be the leading GDP. Also, reported is a wave of Nigerians homeward bound. Let us not judge and complain. Use this time to prepare ourselves to change the stigma and bias of other countries. WE individuals must preapre ourselves to recieve the blessings that have been foretold. A social change is processing.